Of all the food and drink people get a little worked up about, beer and bacon top the list. So, it totally makes sense there's a festival dedicated to celebrating their magnificence. 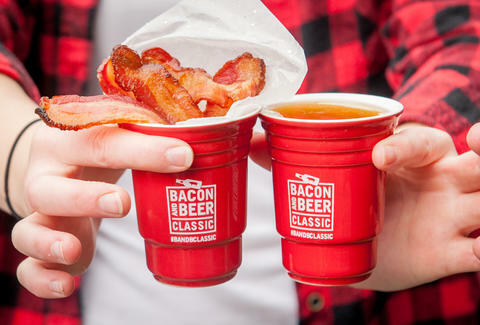 The Bacon and Beer Classic Festival, which has been running for a few years now, brings people together with bacon and beer from their area. Throughout the festival's tour across the US, local craft breweries and kitchens are enlisted to bring festival goers the best of the two titular comestibles. You'll indulge in bacon-on-a-stick, bacon pizza, bacon ice cream, and bacon doughnuts while imbibing local craft beers. Breweries already on the expanding list (which is different in each city) include Redhook, Lift Bridge, Elysian, 10 Barrel, 612Brew, Maui, Rogue, and Ballast Point. There are also events inside the fest, including bacon eating contests and bouncy games for adults that may not always go great with a gut filled with bacon and beer. Ticket prices vary by city. Of the four cities with tickets on sale now, the cheapest tickets can be found in Scottsdale and the Twin Cities where $49 will get you in the door, and VIP tickets cost just $89. At the other end of the spectrum, it costs $69 to get into the Denver festival with VIP tickets hitting $125. Each ticket level grants you different beer and bacon magic. At the general admission level, you're getting about three hours of unlimited beer (4 oz. ceramic cup you can refill) and bacon samplers. Step it up to VIP and you get in an hour before those GA folks, giving quick access to all the best salt and suds. Here are the already announced dates, as well as the list of cities the fest will hit at some unannounced date.